This post does not directly have anything to do with media in Medicine Hat, but it does reflect on a lot of the dietary lifestyles of many Hatters and southeast Albertan’s in general, as we live in an area of the globe that produces a lot of corn, wheat, cattle and much more. How many people consider how much water goes into the things they eat? Probably not many. I never thought about it until I stumbled upon a data layout one day from Smashing Magazine for how much water goes into many things that I commonly eat. For instance, according to the data layout, it takes about 450 litres of water to grow one corn cob, about 500 litres of water to produce one pound of wheat and about 650 litres of water to produce one package of bread for toast. 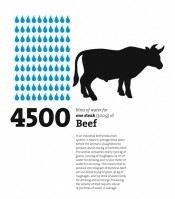 Surprisingly, it takes about 4500 litres of water to process one 300 gram (10 oz) steak, and if that was not a lot of water on its own, if you think about what the cow consumes, it ends up being significantly more. 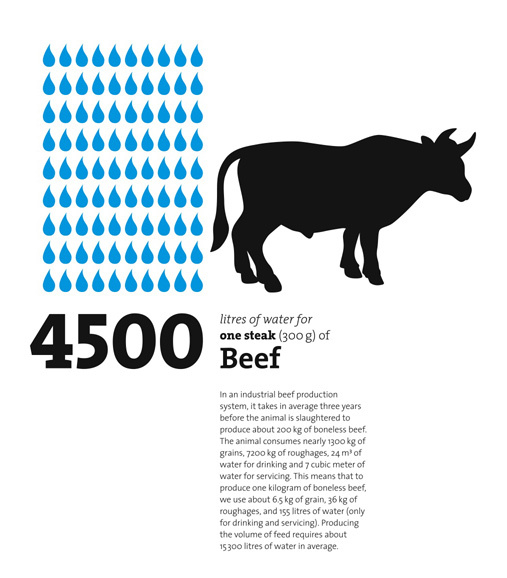 On average, a cow will consume roughly 1300kg of grain, 7200kg of roughages and 24m^3 of water over the course of 3 years before being slaughtered, which ends up taking an average of about 15,300 litres of water. This entry was posted on Thursday, September 24th, 2009 at 3:01 PM and is filed under Websites. You can follow any responses to this entry through the RSS 2.0 feed. You can leave a response, or trackback from your own site.